CONFESSIONS OF A PLATE ADDICT: Metamorphosis Monday..or...A Few Tarnished Old Ladies Revisited! Metamorphosis Monday..or...A Few Tarnished Old Ladies Revisited! 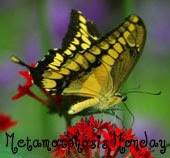 Welcome to another Metamorphosis Monday with our hostess with the mostest, Susan at Between Naps on the Porch! Be sure to stop by her amazing blog to see some incredible before and after projects at her beautiful home and to see the list of this week's participants! I am going to show you some tarnished old ladies and what became of them. This old tea pot was a flea market find...$4.00 because of the broken lid, I suppose. I found it while out Goodwill hunting with my friend Linda at Nina's Nest. My original intention was to clean it up and then spray paint it white....not even salvageable, I thought. But...here it is after a lot of Wright's Silver Creme and elbow grease...starring in Lady Katherine's birthday tea!! I hot-glued the lid on since I will never really use it for tea. I just didn't have the heart to spray paint it when I saw how pretty it was!! Here is a close-up of the grape border. Isn't it gorgeous?? I love grapes!!! You could paste grapes on a stick and I would buy it!!! Here's where the old ladies now reside....on my coffee table! I've added the thrift store coffee butler from a previous post and a silver water pitcher that was a wedding gift many moons ago. Here's one last group of tarnished old ladies...old brass candlesticks that are probably older than some of you!! I have three sets, so I took one of each so they would be more interesting. I am going to spray paint them white. If it doesn't work...no great loss. I never use them as they are. I used white gloss spray paint from Walmart...$1.00 a can! Thanks for stopping by and be sure to stop by Susan's to see some more before and afters! They look better than "pretty good"..I think they look fantastic!! What a difference...that is an amazing transformation. That they are all different, is just like you say..it adds interest. And the cost of the spray paint! I am off to Target tomorrow to buy some. I am out of the white spray paint and that is a great price. Isn't it wonderful what a bit of spray paint can do? I should be in bed right now, Debbie, but I did get my shower and am ready to retire. Then I decided to make one more pass through Blogland, and LOOK! I love what you've done! Love all your finds! And I like your new white "sticks." I want to go find some at GW and spray paint them black. I found some black and white bowls recently and want to put them in the kitchen in St. A! I'll probably be gone most of this week, but I will try to check in and see you! Hi Debbie, Love, love, love what you did with the candlesticks. Those ladies are stylin'. Hope you had a wonderful Easter with your family. I'm SO glad you didin't paint the silver!! The candlesticks look great. I love them white, but if you have other really tarnished brass, try Barkeeper's Friend. It works on brass and stainless without all the elbow grease! The silver looks beautiful. I love that tray. I have a tarnished silver tray in my bath. I have a lamp on it along with some lotions and sprays. Your tea pot transformed into quite a beauty! I can also see it as a vase for fresh flowers…. Your tray is also really pretty, and with such great detailing. Your silver water pitcher is gorgeous, if you ever decide you do not want it anymore just let me know, ha ha…. It is so amazing what a can of spray paint will do. The brass candlestick holder makeover does look pretty darn great. Oh Deb - I think there will be a mass sale for white spray paint this week. LOL Who doesn't have some old candlesticks laying around in the back of their cupboard? This is lovely! Hi Debbie! I've missed you! Oh, I love your old ladies and they all look so fabulous! I'll bet you've got the greatest muscles in blogland! Ok, now you have Oprah and Carmen ticked off at you! Hee, hee. BEAUTIFUL! Love the way the silver polished up, but I have to say I'm most in love with the candlesticks once they were sprayed. Great transformation - you know, they sold something like this at Horchow for well over $150/per candle! You did a great thing here Debbie! Great job! You have inspried me! We have rummage sales coming up soon. Maybe I can find some treasures to transform! Wish me luck! Proof Positive that there is hope for us "tarnished old ladies"... something that I know, I personally am sincerely thankful for! Now you are making me want to polish silver! I have lots of old pieces from family members that I'm sorry to say I never even look at. I will definitely have to remedy that situation. Beautiful metamorphosis, Debbie! I'm going to have to pay closer attention when browsing resales and flea markets. What gorgeous pieces you found!! The silver is gorgeous...but I really want those candlesticks!! Great job! My old brass candlesticks had better hide out if the sun comes out here in Misssouri because they are "in for a paintin'". Great job with both projects. Thank you for sharing. Just visiting all today... Great job on all of them and yes that grape tray is gorgeous. I love grapes, too! Great Met Monday post, love that tray too, pretty edge. Way to go on your redos! Your tarnished old ladies are looking might fab. I've painted many tarnished old ladies over the years that didn't spiffy up so good. You gave your finds a second life. Line a tub, tray, or sink with alum. foil...boil some water, like a gallon...put your silver in the container...put the baking soda in the water, and pour over your silver. It will bubble and toil...and clean like magic. Rinse, and dry...viola!! Glad you're back and these are all stunning! I love your grapes as well! You find the best silver pieces! I like the tarnished look personally. That silver teapot is incredible! I gasped when I saw the "after"! Oh, and I'm a total white paint addict. If you stand still for too long in my house, its quite likely you'll end up with a couple of coats of white paint! Amazing the treasures to be found at GW !!! Your teapot looks like new and just love the look of the candle sticks in white. Your candlesticks and silver pieces are beautiful!!! I have to start shopping at Goodwill! Debbie ,i'm so glad you're back .i missed you.i know you were enjoying the company with your family as i was. your $4.00 teapot is stunning.i am also looking for one.i have a gw tray,a sugar bowl and a creamer now also.all i need is a pot.yours looks awesome. How pretty! I adore silver. I think it looks so elegant. I like the way you put everything together and have it sitting on your coffee table. It looks very inviting. Oh my this all turned out so spectacular! I adore the candlesticks in White. Ou little bunny guy is safe. Chestnut is strictly indoor only. I would absolutely lose my mind if he ever got out. I know I'm a bit silly. I am so overprotective of him. I just hear so many car accident stories I panic. He does not care or know the difference at all. See you at the Target birdie event! My OW post isn't ready. The weather has been just awful for pictures lately. I'll join Barb's event instead.